Honeycomb isn't just for Georgia Tech's helmets anymore. Last Thursday, backup quarterback Synjyn Days tweeted a picture of Georgia Tech's new honeycomb helmets and abruptly took it down. 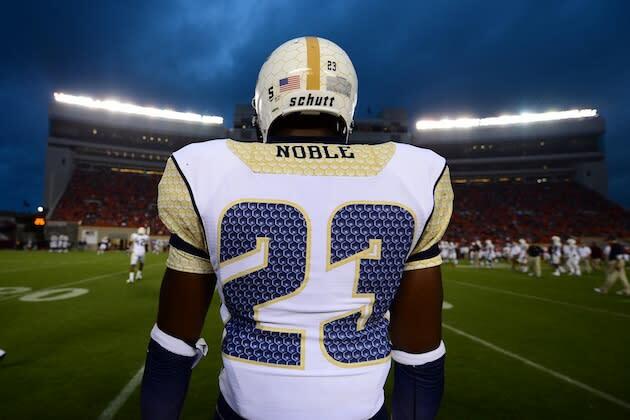 Little did we know that the honeycomb actually infiltrated the entire uniform; every Georgia Tech uniform — for the entire season. Usually we see this type of, um, creativity from Nike or adidas or even Under Armour, but now Russell Athletic, which makes the Yellow Jackets' uniforms, is getting in on the act. It definitely doesn't look bad and we've certainly seen worse, but I can't stop staring at the blue numbers. They're a trip, like one of those eye puzzles where if you stare at it long enough a whole other image emerges. It's mesmerizing. And perhaps that's the point. Perhaps Georgia Tech is using the honeycomb numbers as another way to distract defenses in addition to the triple option creativity. It certainly worked (in conjunction with Virginia Tech's poor tackling) on the Yellow Jackets' first touchdown Monday night.